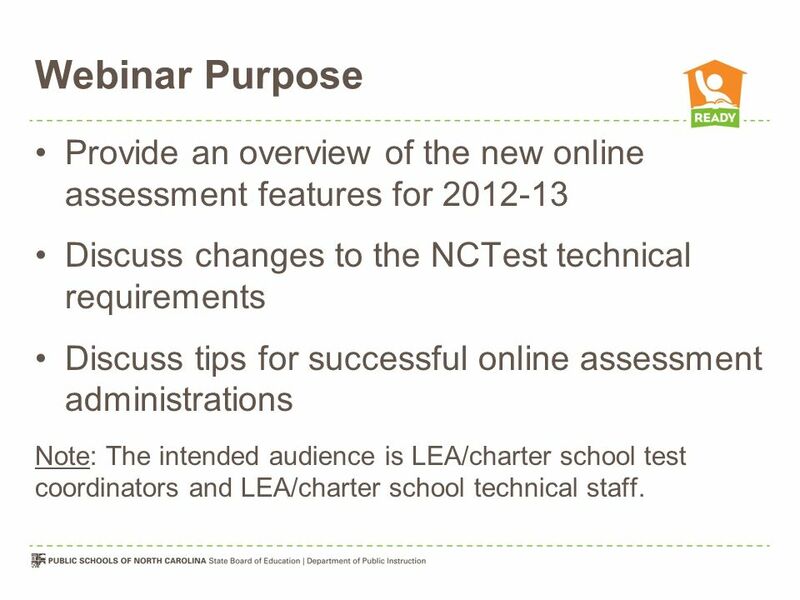 2 Webinar Purpose Provide an overview of the new online assessment features for Discuss changes to the NCTest technical requirements Discuss tips for successful online assessment administrations Note: The intended audience is LEA/charter school test coordinators and LEA/charter school technical staff. 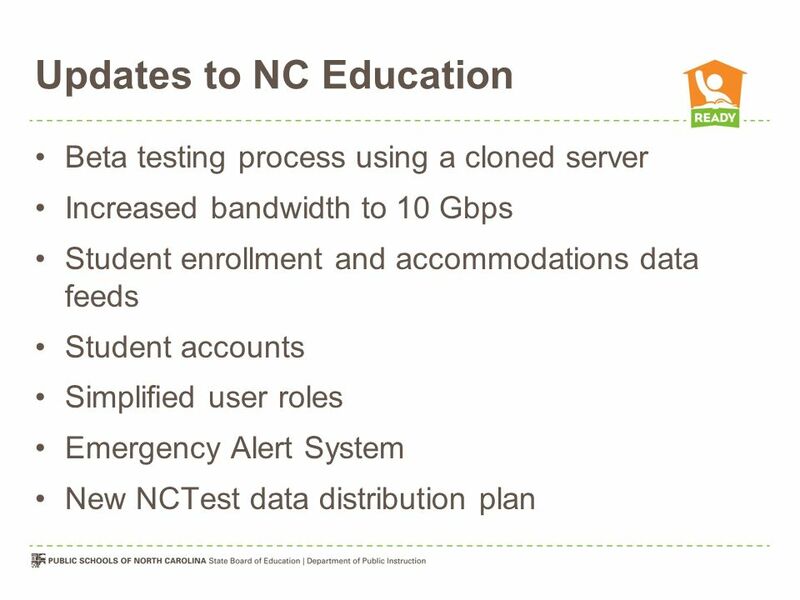 Beta testing process using a cloned server Increased bandwidth to 10 Gbps Student enrollment and accommodations data feeds Student accounts Simplified user roles Emergency Alert System New NCTest data distribution plan NC Education now accepts student enrollment data from NC WISE and accommodations data from NC WISE, CECAS, and third-party accommodations management systems. Student enrollment data is used to create student accounts, guide test material ordering, and register students for general online assessments in NCTest. 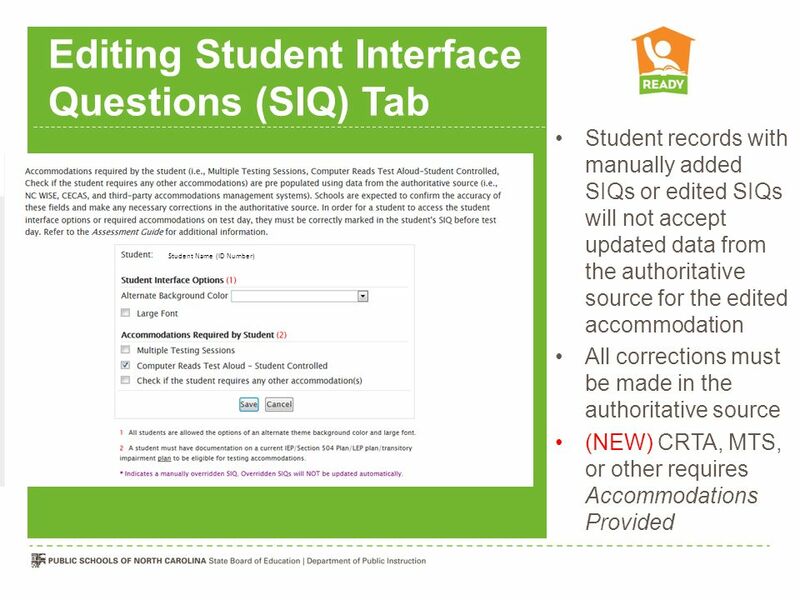 Accommodations data is used to guide test material ordering, pre-populate Student Interface Questions (SIQ) in NCTest, and register students for NCEXTEND2 or NCEXTEND1 assessments. NC Education and NCTest are monitored separated by a Pingability monitoring service. 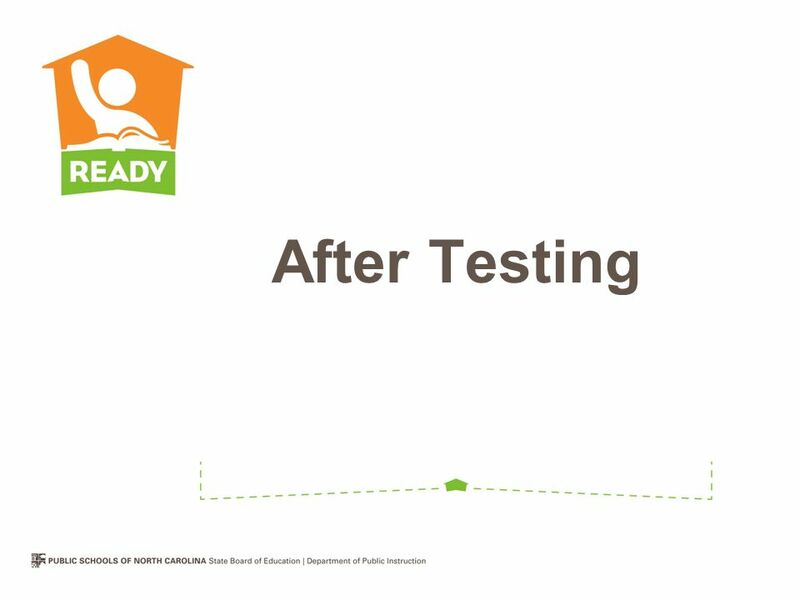 The Emergency Alert System will automatically notify members of the NC Education group by if NC Education is not available and members of the NCTest group by if NCTest is not available. More information is forthcoming. The new data distribution plan is discussed later in this presentation. 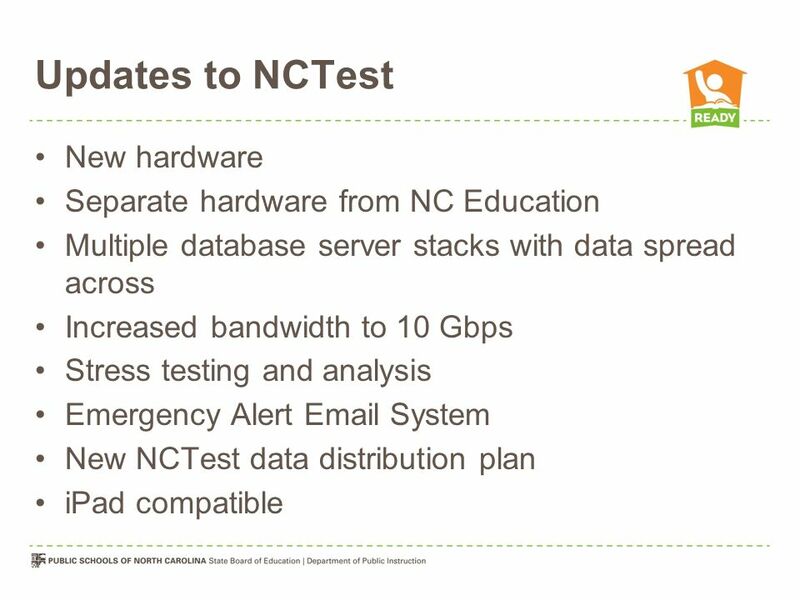 Multiple database server stacks with data spread across Increased bandwidth to 10 Gbps Stress testing and analysis Emergency Alert System New NCTest data distribution plan iPad compatible NC Education and NCTest are monitored separated by a Pingability monitoring service. 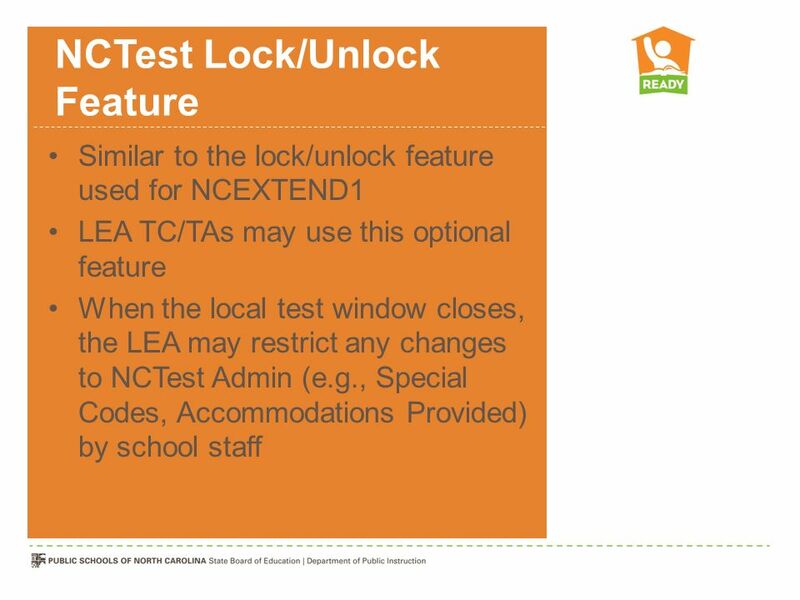 The Emergency Alert System will automatically notify members of the NC Education group by if NC Education is not available and members of the NCTest group by if NCTest is not available. Members will also receive an when the system(s) is available again. More information is forthcoming. The new data distribution plan is discussed later in this presentation. Who? Every student participating in online EOC or EOG assessments Where? At least one time at school When? Before test day How? Using video or script EOG tutorials are expected in February 2013 The Online Assessment Update memo from Rebecca Garland and Angela Quick was sent to all LEA Superintendent's and Charter School Directors on October 11, LEA and schools must document their plan for ensuring all students complete the Online Assessment Tutorial before test day in LEA and school testing plans. 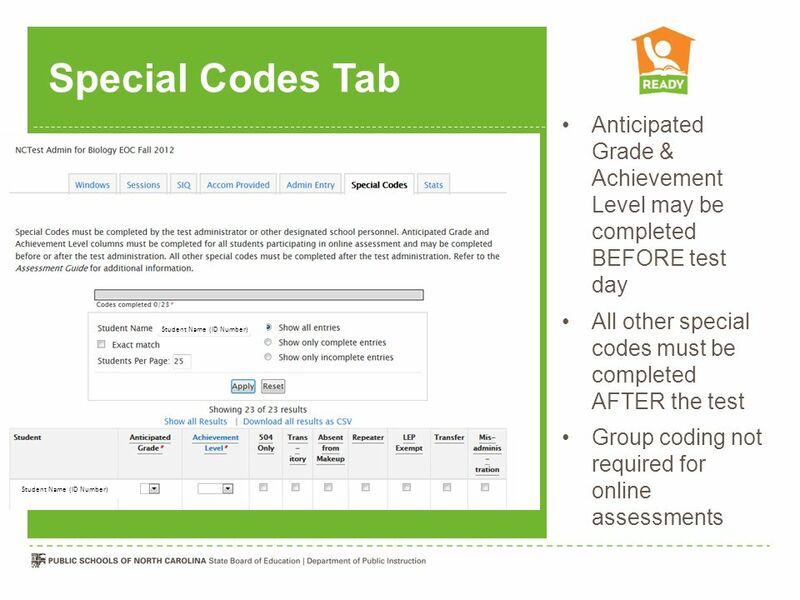 Schools may use one of two Online Assessment Tutorial options. (1) The new Online Assessment Tutorial will offer an option to play a video. 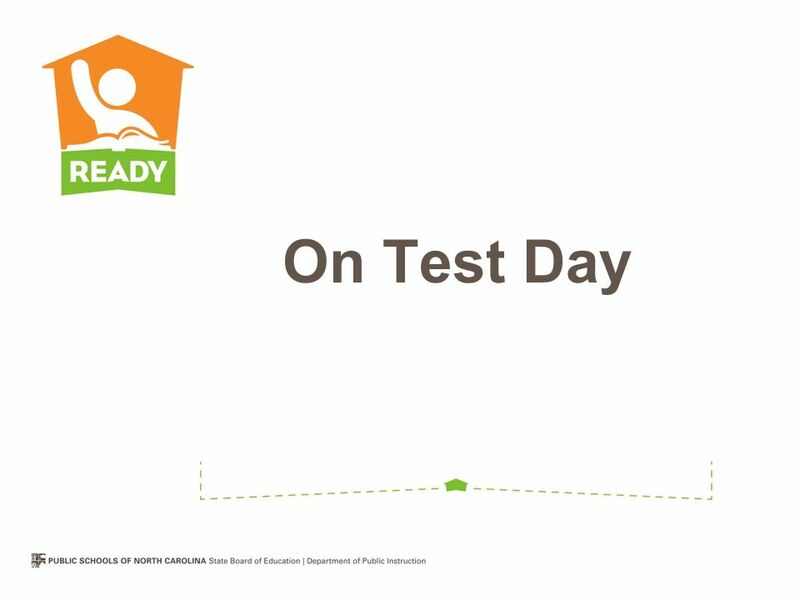 The video will give guidance for using available tools (e.g., flag, strike, highlight), navigating the system, responding to each item type, and using the end-of-test review page. Immediately following the video, students must complete a self-paced interactive set of online sample items for the appropriate assessment offered in the same environment as the assessment. 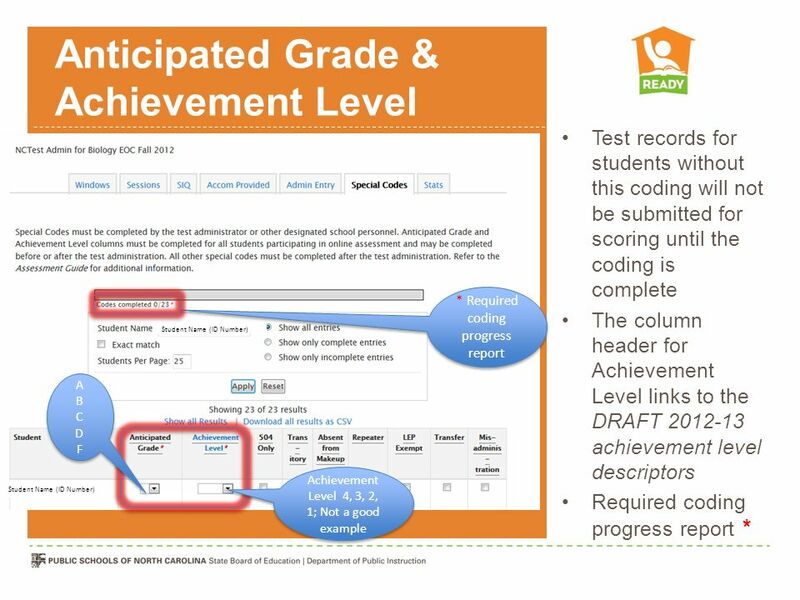 (2) Schools will use a standard script developed by the NCDPI giving guidance for using the available tools (e.g., flag, strike, highlight), navigating the system, responding to each item type, and using the end-of-test review page while students are viewing tutorial item number 1 for the appropriate assessment. Students will then complete the remainder of the self-paced tutorial items. Teachers should use the Online Assessment Tutorial to determine each student’s appropriate font size (i.e., regular or large) and/or alternate background color for test day. 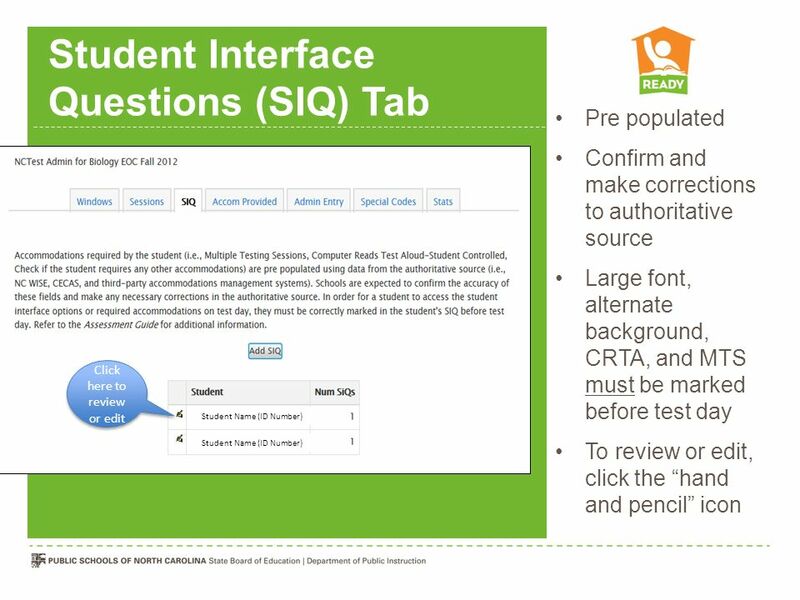 These options must be entered in the student’s interface questions (SIQ) before test day. The Online Assessment Tutorial can assist students who require the Large Print accommodation to determine if Large Font will be sufficient. If the size of the Large Font is not sufficient for a student because of his/her disability, this accommodation may be used in conjunction with the Magnification Devices accommodation, or a Large Print Edition of the paper-and-pencil assessment may be ordered. Completing the Online Assessment Tutorial in a large-scale fashion also provides a minimal test of configurations. 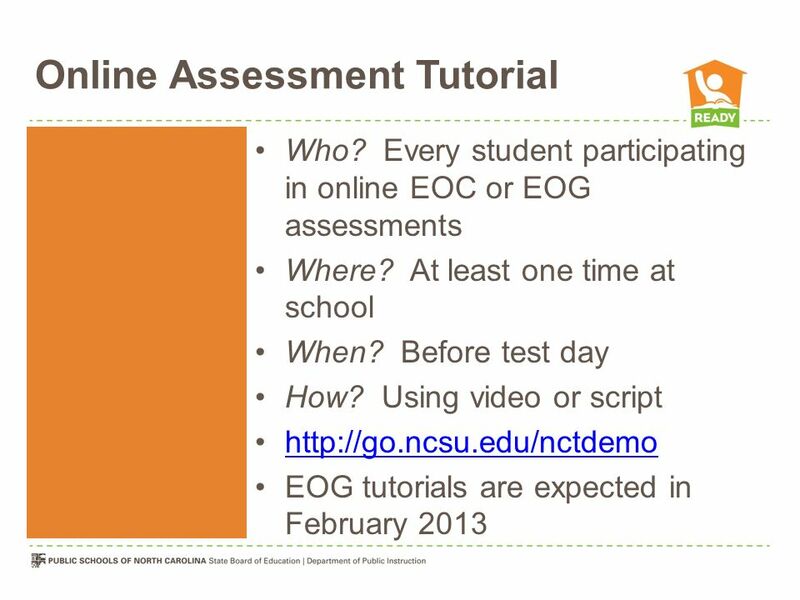 Tutorials for the EOG assessments are expected to be available in February 2013. Online version presented in the same interactive environment Responses are not saved or scored Online version answer key Released test forms are available in an online assessment version and in a paper-and-pencil (p/p) version. Online sample forms are presented in the same interactive environment as the actual assessment. Students have an opportunity to practice using the online tools and the navigation buttons while completing online items. Responses will not be scored. Once the online assessment is ended or the browser is closed, all responses will be cleared. The paper-and-pencil (p/p) versions are available in a pdf format. These contain the same multiple-choice and gridded response items as the online version, but they do not contain the technology-enhanced items (TE). TE items require students to manipulate the item and can only be completed in an online environment. An answer key identifying the correct answer and the primary standard each item is aligned to is available for each released online and paper-and-pencil test form. 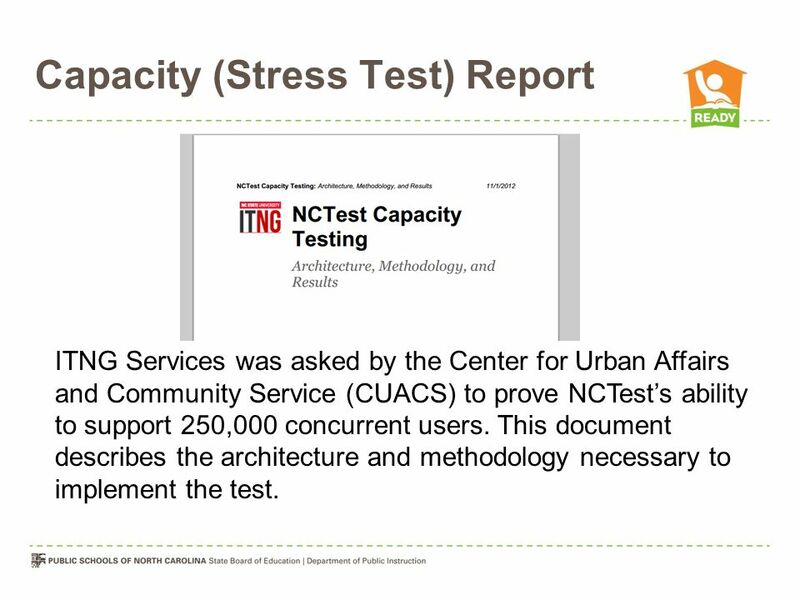 ITNG Services was asked by the Center for Urban Affairs and Community Service (CUACS) to prove NCTest’s ability to support 250,000 concurrent users. This document describes the architecture and methodology necessary to implement the test. The entire report is available at: go.ncsu.edu/nct. 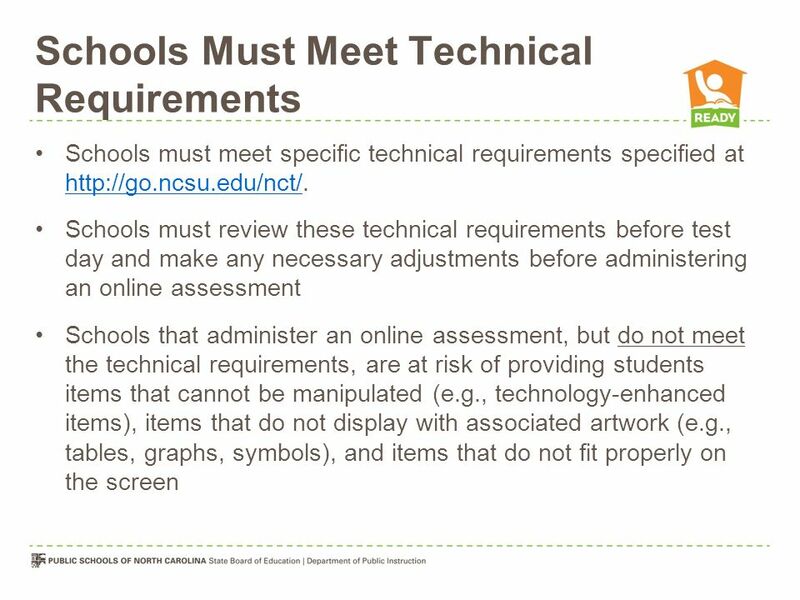 Schools must meet specific technical requirements specified at Schools must review these technical requirements before test day and make any necessary adjustments before administering an online assessment Schools that administer an online assessment, but do not meet the technical requirements, are at risk of providing students items that cannot be manipulated (e.g., technology-enhanced items), items that do not display with associated artwork (e.g., tables, graphs, symbols), and items that do not fit properly on the screen To ensure students receive a valid and reliable administration of an online assessment, schools must meet specific technical requirements. Browser and operating system requirements specified at must be followed. 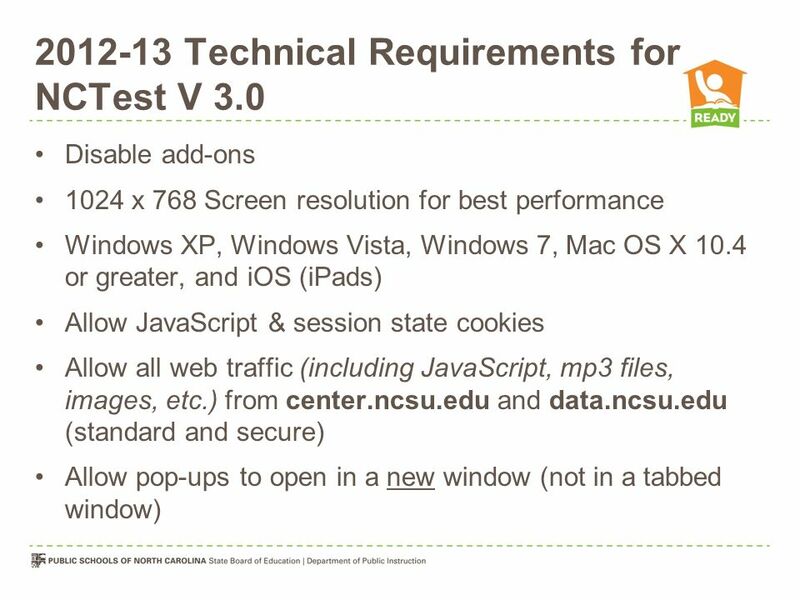 Microsoft Internet Explorer versions 8 and 9, Mozilla Firefox versions 10+, Apple Safari , Google Chrome version 21+ (IE 6.0 is not allowed to access NCTest) Schools using Internet Explorer (IE) versions 8 and 9 must turn off Compatibility View or remove center.ncsu.edu and data.ncsu.edu For bandwidth footprint and best practices for wireless networking, go to: go.ncsu.edu/nct Periodically check the requirements for updates at go.ncsu.edu/nct Effective with the 2012–13 school year, schools using Microsoft Internet Explorer 6.0 will no longer be allowed to access NCTest due to security vulnerabilities and concerns. Schools using Microsoft Internet Explorer 7.0 will be allowed to access NCTest although the browser will not be supported by the Help Desk Supported browsers include the following: Microsoft Internet Explorer versions 8 and 9, Mozilla Firefox versions 10+, Apple Safari , and Google Chrome version 21+. If you have any questions regarding your school’s technical specifications, contact your appropriate LEA technical staff. 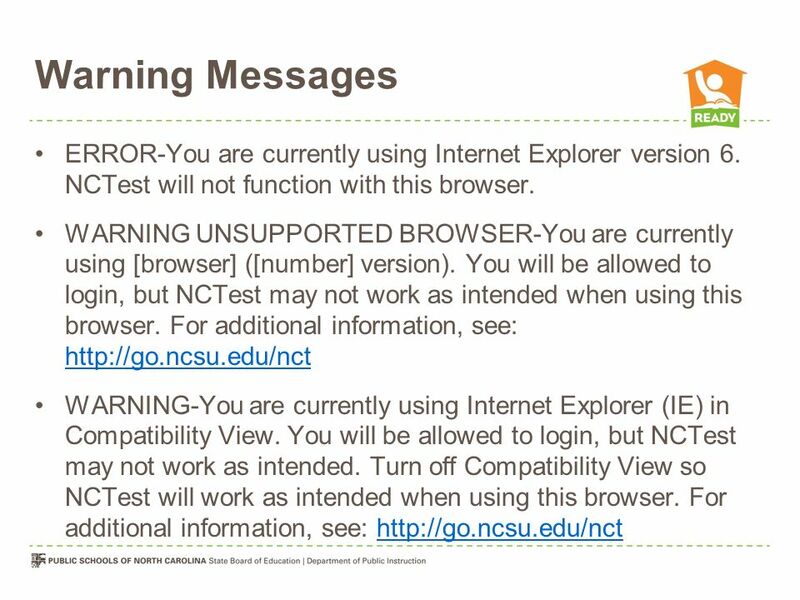 Schools using Internet Explorer (IE) versions 8 and 9 must turn off Compatibility View or remove center.ncsu.edu and data.ncsu.edu from the list of websites to display in Compatibility View. Compatibility View requires newer versions of IE to function as IE 7.0 which is not a supported browser. 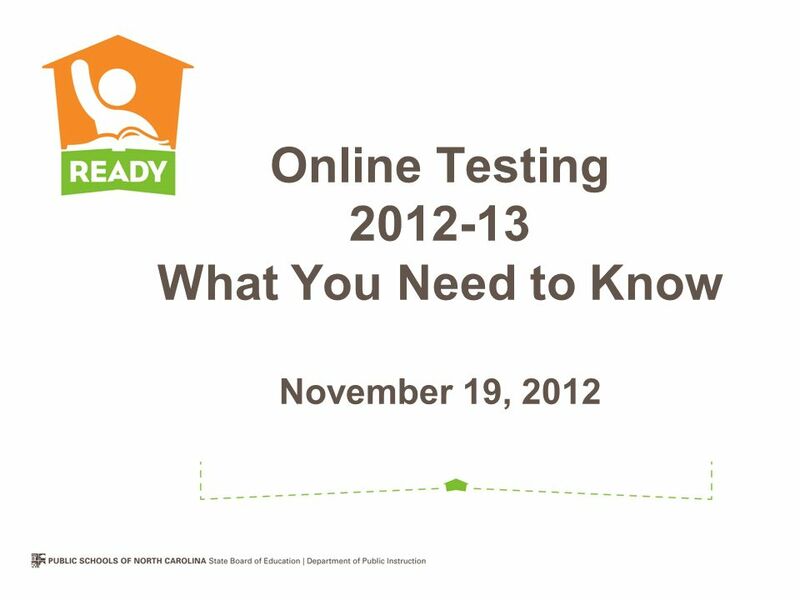 iPads and MacBooks may be used to administer assessments using the NCTest online testing system during the school year. They must meet the technical requirements listed at: go.ncsu.edu/nct. Chromebooks are not currently supported. Completing the Online Assessment Tutorial or an online released form in a large-scale fashion also provides a minimal test of configurations. Communication among district-level staff and school-level staff is extremely important when planning online test administrations and all facets of the process should be discussed as early as possible. 20 Chromebook Devices The NCDPI does not support Chromebook devices for administering end-of-grade and end-of-course online assessments at this time. 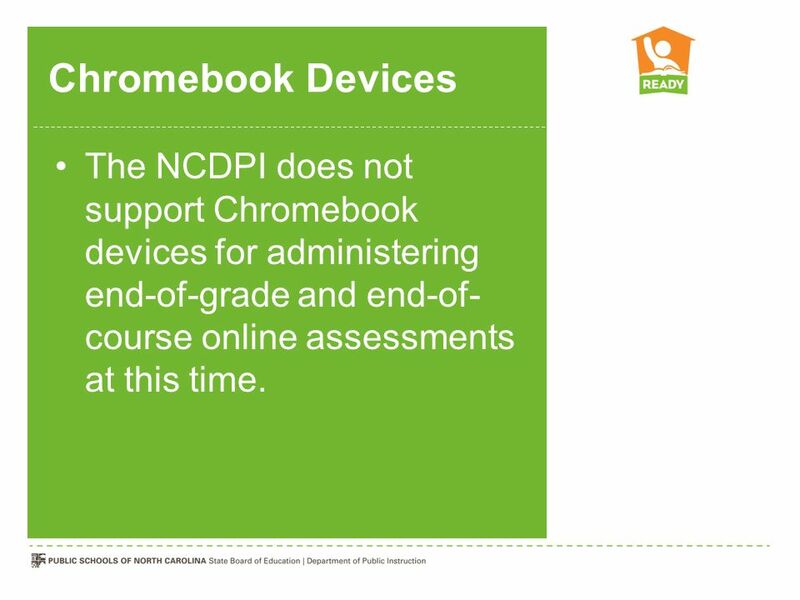 The NCDPI does not support Chromebook devices for administering EOG and EOC online assessments at this time. Chromebooks should work if they are kept up-to-date and meet all other technical requirements. However, Chromebooks have not been beta tested in a large-scale, school environment. 21 Warning Messages ERROR-You are currently using Internet Explorer version 6. NCTest will not function with this browser. WARNING UNSUPPORTED BROWSER-You are currently using [browser] ([number] version). 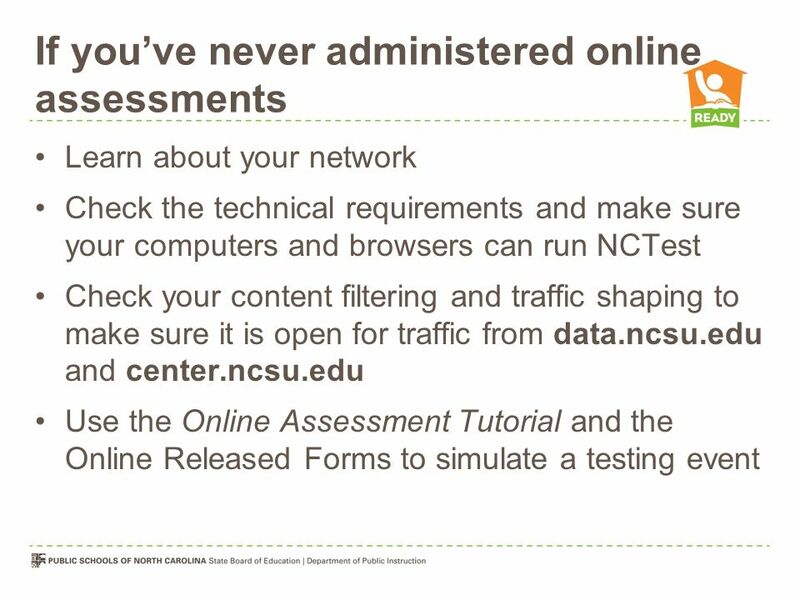 You will be allowed to login, but NCTest may not work as intended when using this browser. For additional information, see: WARNING-You are currently using Internet Explorer (IE) in Compatibility View. 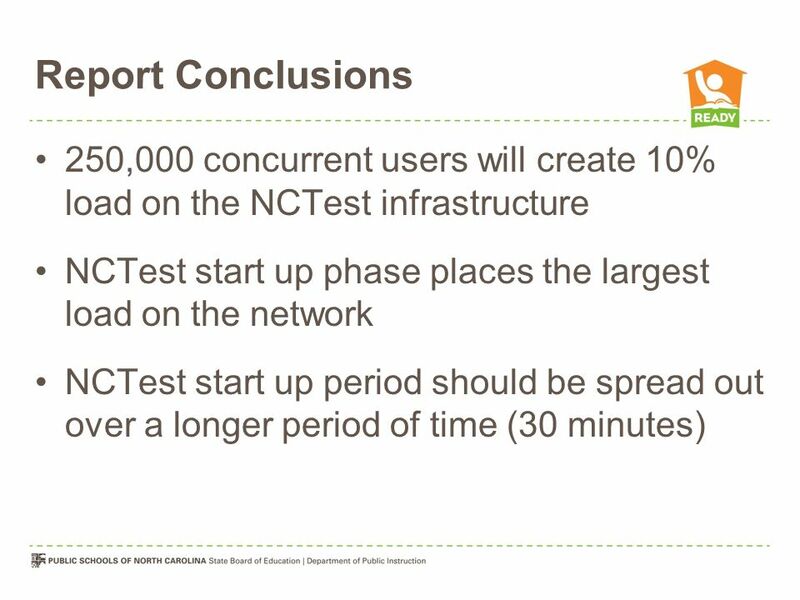 You will be allowed to login, but NCTest may not work as intended. Turn off Compatibility View so NCTest will work as intended when using this browser. For additional information, see: Students participating in the Online Assessment Tutorial, online released test forms, or end-of-semester/year NCTest online assessments on computers with unsupported browsers will receive warning messages. Examples of those messages are displayed on this slide. Please share this information locally. Due to security concerns, computers using Internet Explorer version 6 will not allow the user to log into the Online Assessment Tutorial, online released test forms, or the NCTest online assessment this year. 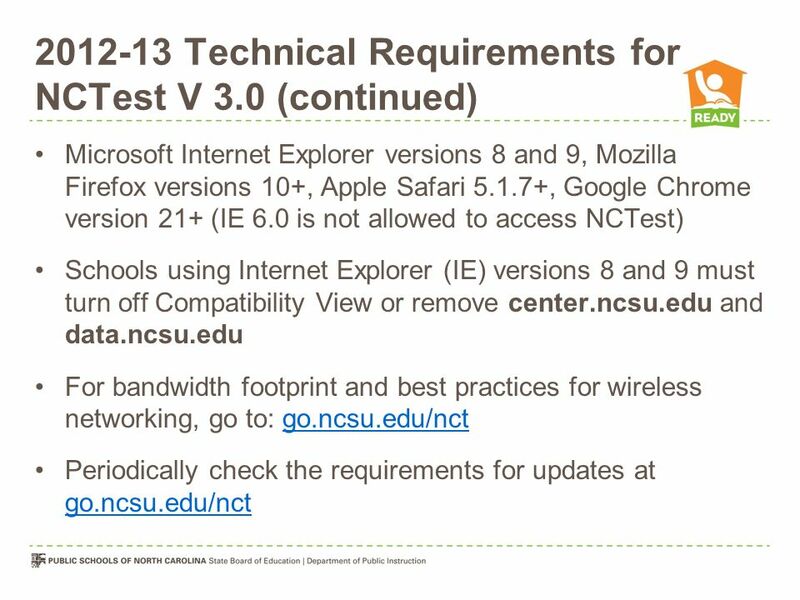 Schools using Internet Explorer (IE) versions 8 and 9 must turn off Compatibility View or remove center.ncsu.edu and data.ncsu.edu from the list of websites to display in Compatibility View. Compatibility View requires newer versions of IE to function as IE 7.0 which is not a supported browser. 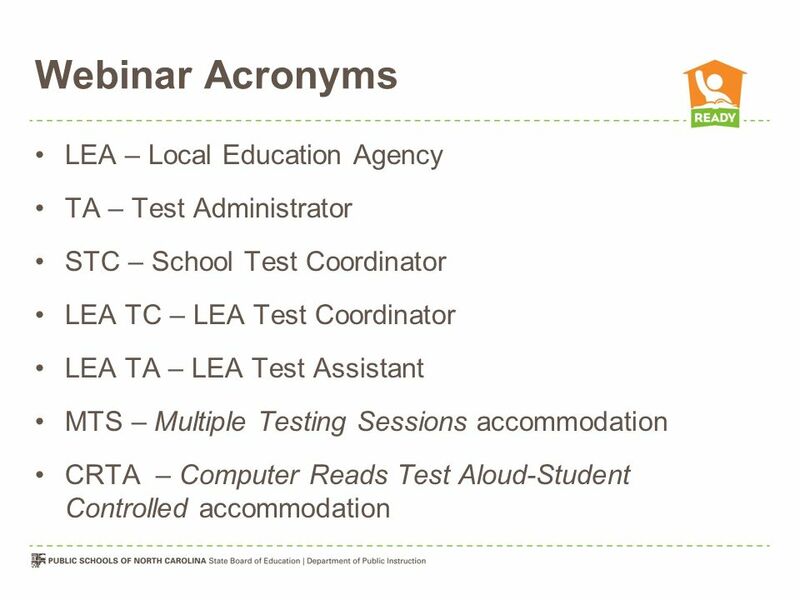 22 CRTA Accommodation Audio is available for item stems and answer choices No audio files for graphics, graphs, or tables within a test item, or application content, menus, embedded tools (e.g., Reset, Flag), error messages, warning/reminder messages, or section summaries Combination of both the Test Administrator Reads Test Aloud and Computer Reads Test Aloud—Student Controlled accommodations may be needed Must also receive the Testing in a Separate Room accommodation (one-on-one) unless using headphones For additional information, refer to the Testing Students with Disabilities document at: wd1213.pdf The Computer Reads Test Aloud—Student Controlled accommodation is not designed to read all parts of the computer screen. Audio files are available for item stems and answer choices. There are no audio files within the test environment for graphics, graphs, or tables within a test item, or application content, menus, embedded tools (e.g., Reset, Flag), error messages, warning/reminder messages, or section summaries. 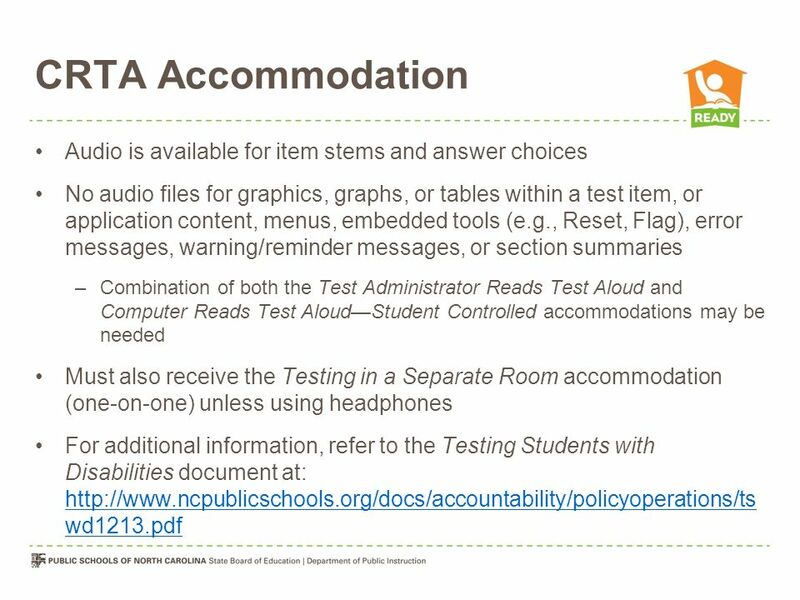 If a student requires any of these components to be read aloud, it may be appropriate for the student to receive a combination of both the Test Administrator Reads Test Aloud and Computer Reads Test Aloud—Student Controlled accommodations. Students receiving the Computer Reads Test Aloud—Student Controlled accommodation must also receive the Testing in a Separate Room accommodation (one-on-one) unless using headphones. 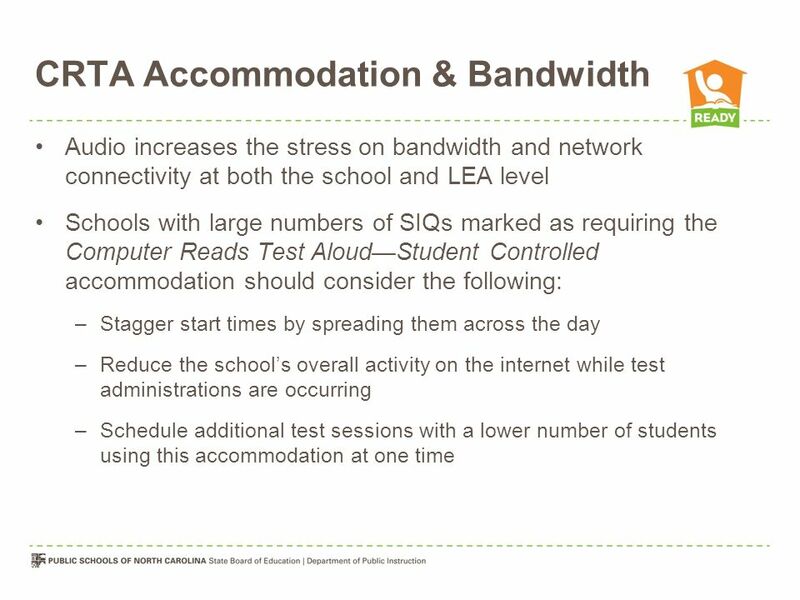 Audio increases the stress on bandwidth and network connectivity at both the school and LEA level Schools with large numbers of SIQs marked as requiring the Computer Reads Test Aloud—Student Controlled accommodation should consider the following: Stagger start times by spreading them across the day Reduce the school’s overall activity on the internet while test administrations are occurring Schedule additional test sessions with a lower number of students using this accommodation at one time The Computer Reads Test Aloud—Student Controlled accommodation increases the stress on bandwidth and network connectivity at both the school and LEA level. Significant use of this option may impact LEAs' and/or schools' network performance. 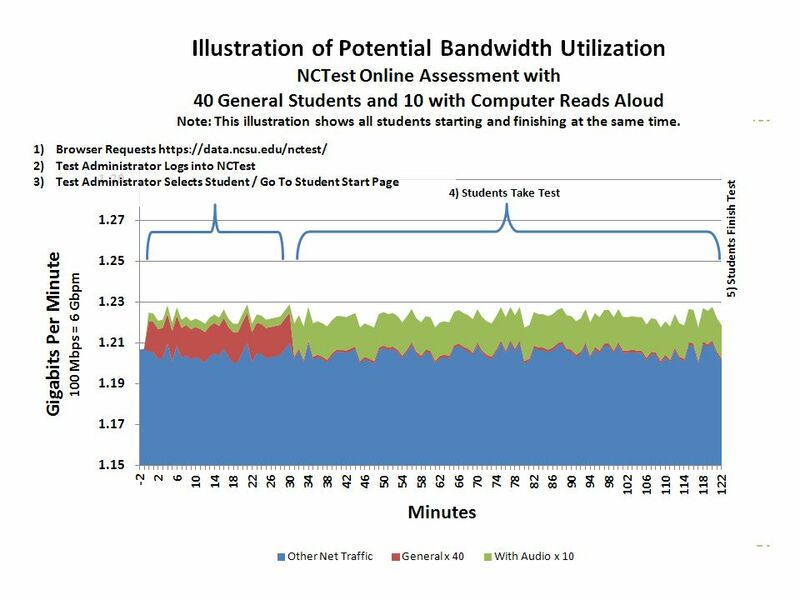 Therefore, it is imperative that schools consider local bandwidth when scheduling students. 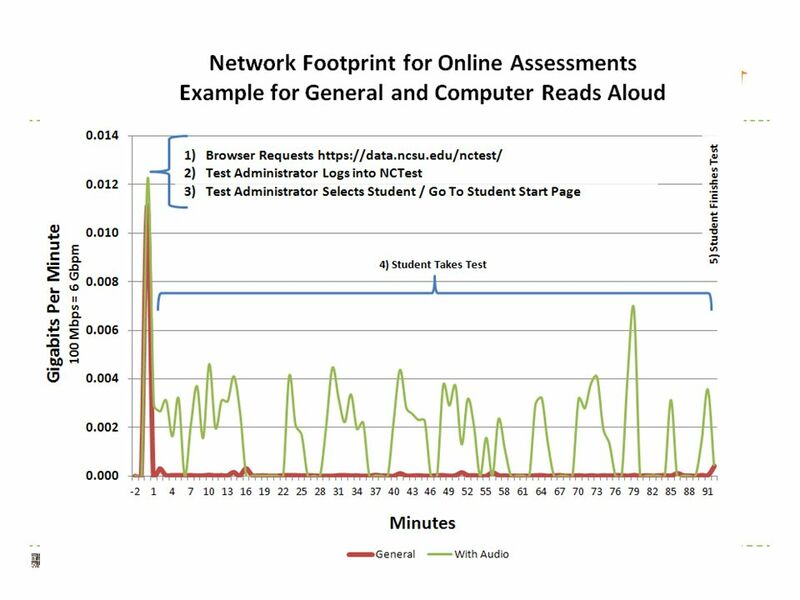 Schools with large numbers of SIQs marked as requiring the Computer Reads Test Aloud—Student Controlled accommodation should consider the following: Stagger start times by spreading them across the day. 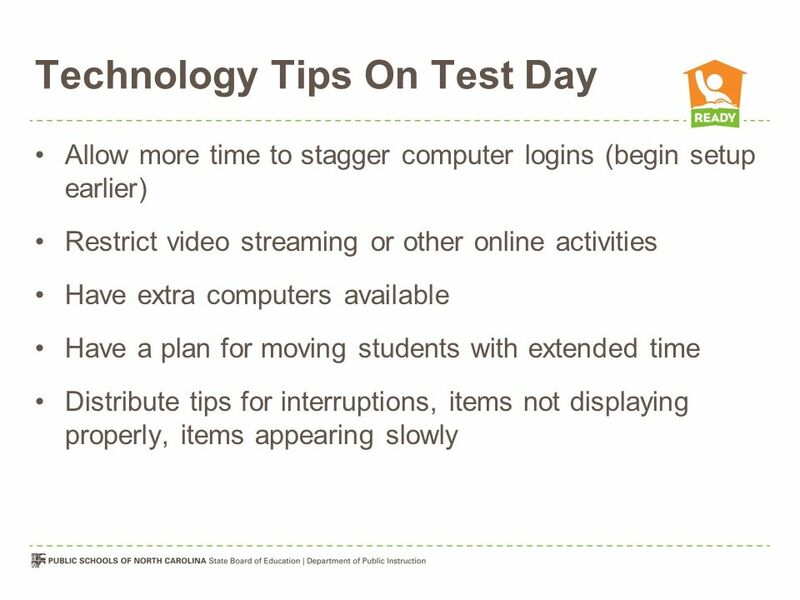 Reduce the school’s overall activity on the internet while test administrations are occurring. Schedule additional test sessions with a lower number of students using this accommodation at one time. 24 Help Desk Report an incident to the Help Desk by one contact person using one method of communication or ) Callers should provide the following information: First and last name and title/position of contact person; Phone number and/or address; School district name; School name; LEA/school code; Test name (course or subject and grade level); Form number (available at the top of the screen); Description of incident; Error message(s) (document the words verbatim); Browser name and version (e.g., Internet Explorer 8.0) The Help Desk should provide the caller with a ticket number for reference A Help Desk is available for the online assessments. 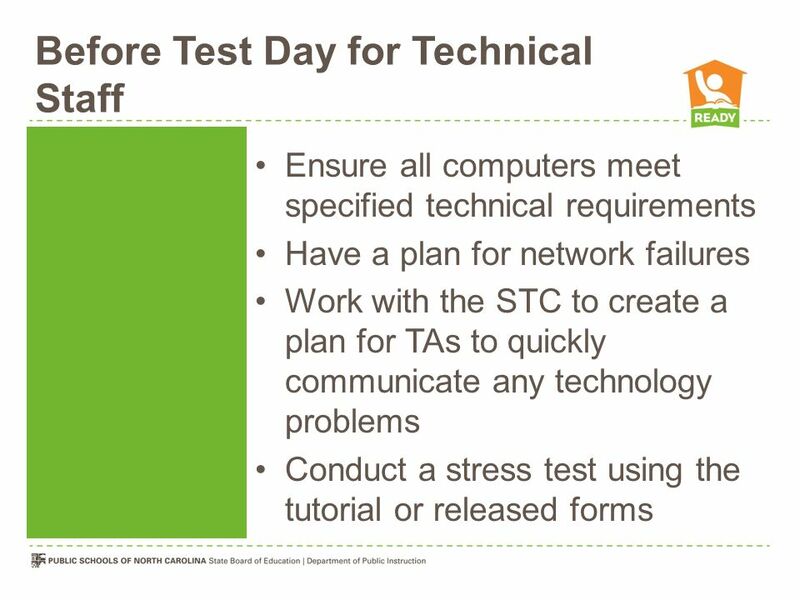 Schools that encounter technical problems during an online assessment should first contact the local technology coordinator. Many technical issues can be resolved locally by ensuring that students are using accepted hardware, making adjustments to the local network, ensuring all required applications are loaded and meet necessary version requirements, and setting a minimum screen resolution. If a problem cannot be resolved locally, the incident should be reported to the Help Desk by one contact person using one method of communication (i.e., or phone call). The designated contact person must be available to receive a response from the Help Desk. requests are preferred for Help Desk communications and should be sent to requests will receive an auto-reply with a ticket number for reference. Phone requests can be placed by calling (919) from 7:30 a.m. to 5:00 p.m., Monday through Friday (excluding holidays). The Help Desk should provide the caller with a ticket number for reference. 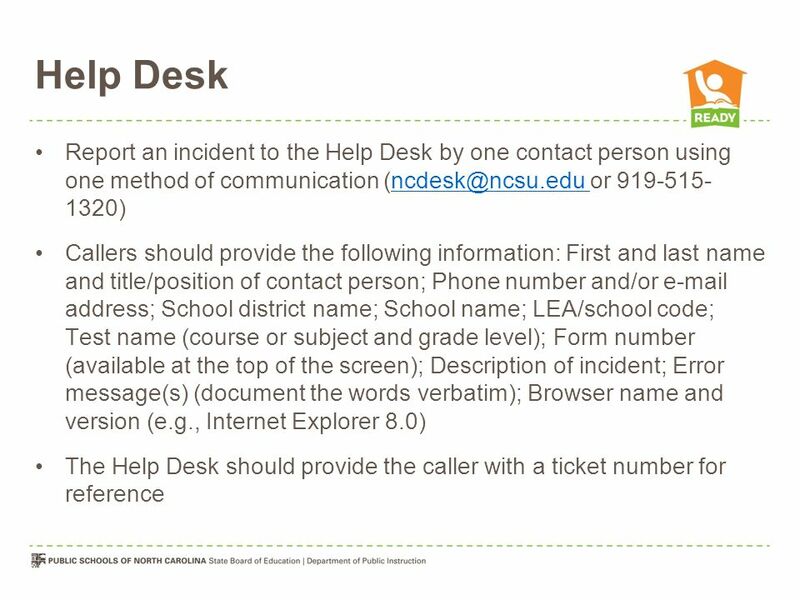 If the Help Desk does not provide a ticket number, the caller should request one. 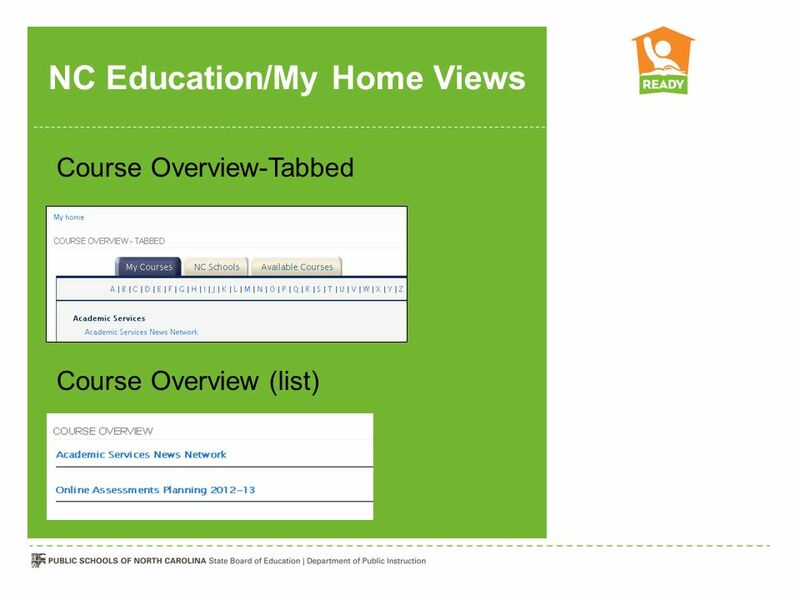 Course Overview-Tabbed Course Overview (list) The My Home page of NC Education may be customized for one of two different views. NC WISE, CECAS, and third-party accommodations management systems Corrections must be made in the authoritative source IEPs must be closed and verified Accommodations must not be expired At the close of business, data is pulled, processed the following day, & available the next morning (except third-parties) NC Education now accepts student enrollment data from NC WISE and accommodations data from NC WISE, CECAS, and third-party accommodations management systems. Student enrollment data is used to create student accounts, guide test material ordering, and register students for general online assessments in NCTest. 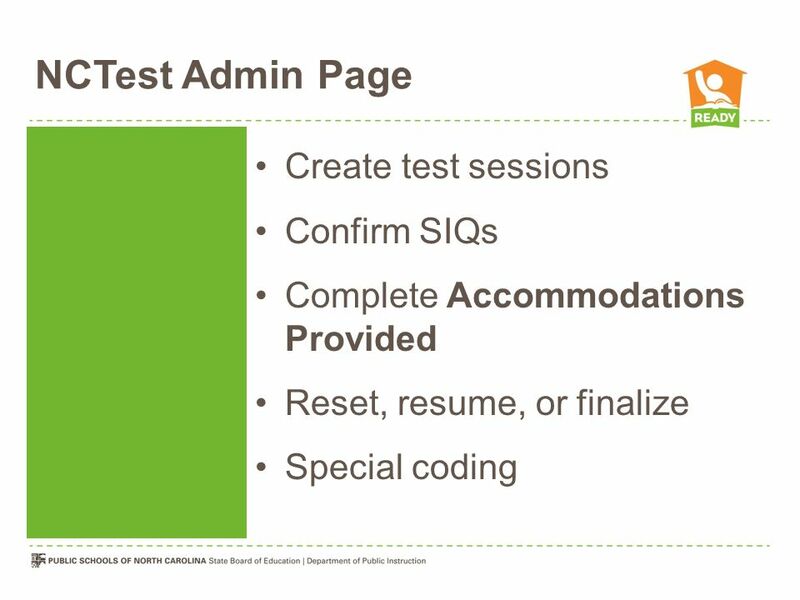 Accommodations data is used to guide test material ordering, pre-populate Student Interface Questions (SIQ) in NCTest, and register students for NCEXTEND2 or NCEXTEND1 assessments. LEAs are expected to review these lists and make any necessary corrections in the authoritative source. 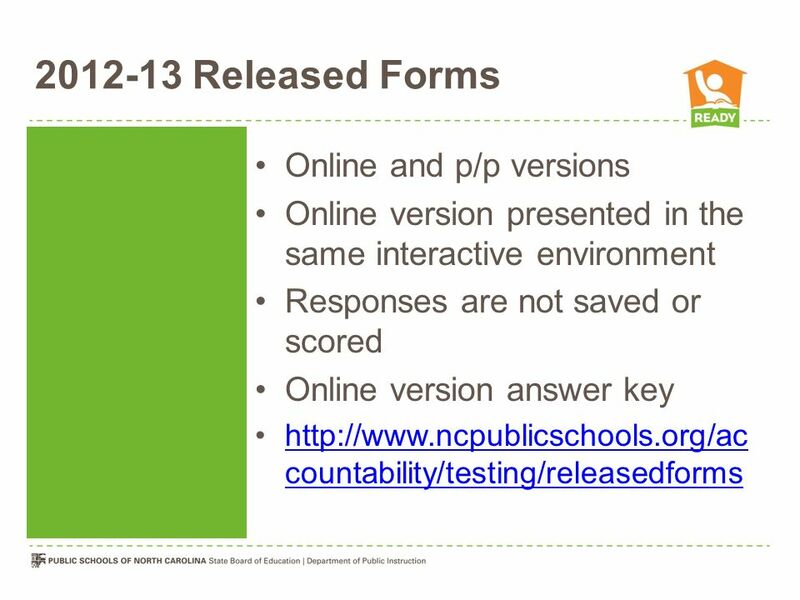 Any changes to the authoritative source will be reflected in NC Education after the next data feed. At the close of business each day, data is pulled from the authoritative source, processed the following day, and made available overnight. For example: Student data is pulled at approximately 5pm on Monday, processed on Tuesday, and available to the user by 7am on Wednesday. 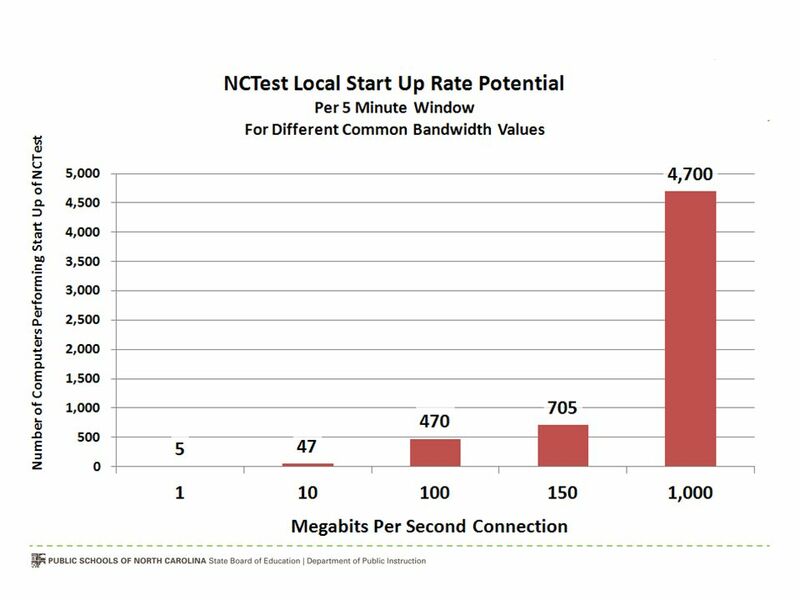 Therefore, if the user compares NC WISE to NC Education, the data may not match. Third-party accommodations management systems normally submit their data to CECAS once each week. The enrollment and verification lists reflect received data. Therefore, the LEAs using third-party accommodations management systems will not receive daily updates to their enrollment and verification lists. 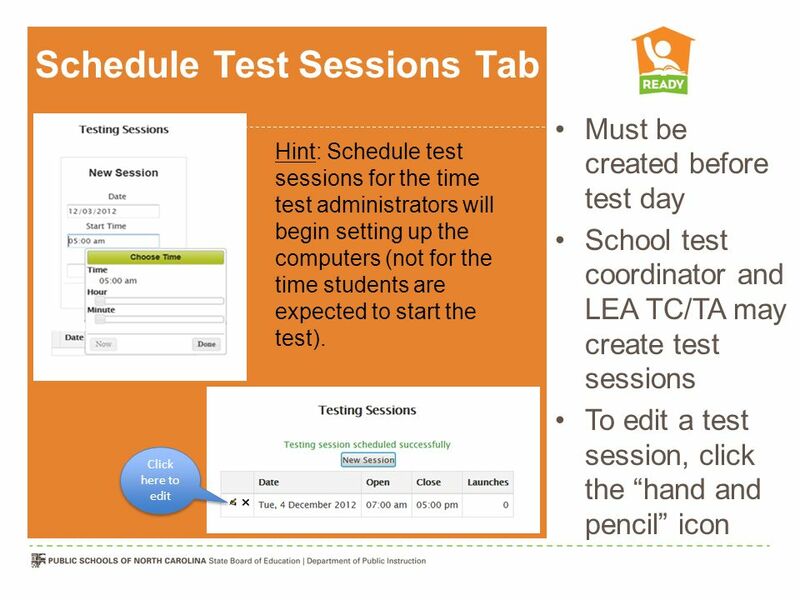 Paper-and- pencil materials only Estimated Need is course enrollment plus 10% Test materials may be ordered by LEA test coordinators/test assistants through the Testing News Network (TNN). LEAs planning to administer paper-and-pencil assessments must record quantities of standard test books and interleaved answer sheets needed in the boxes provided. Enrollment counts include 10% overage in the standard test books column. Orders exceeding 20% overage will not be accepted. 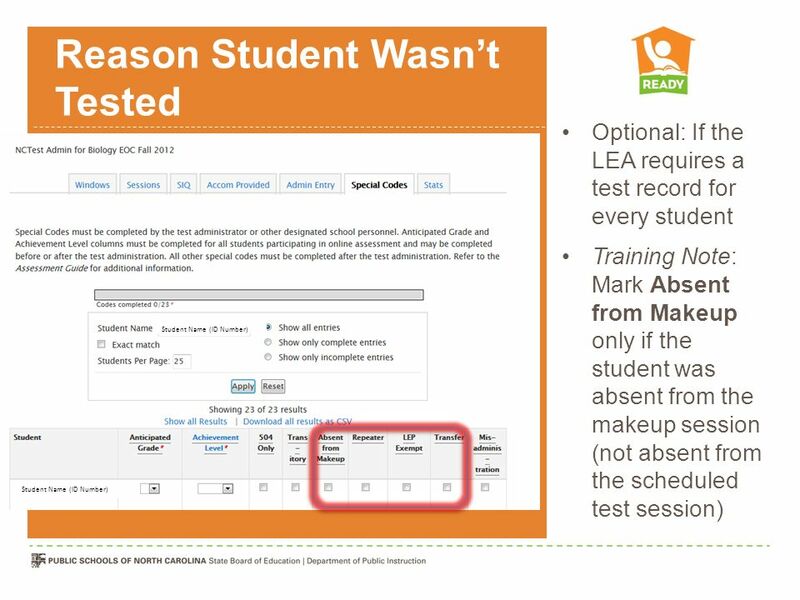 LEAs planning to administer online assessments should reduce the number of standard test books by the number of students participating in online assessment. 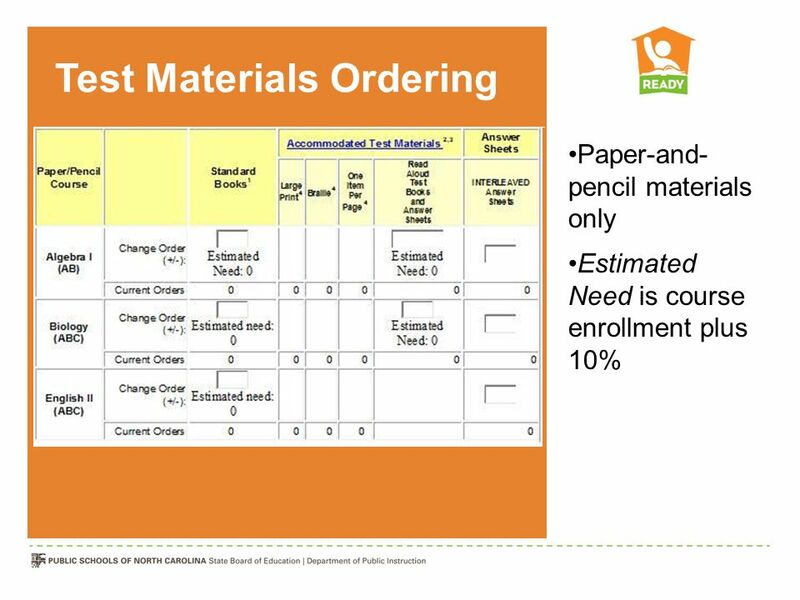 Paper-and-pencil accommodated test materials (i.e., large print, Braille, one test item per page) will be ordered/shipped based on the Accommodated Materials Verification Lists. LEAs/schools are expected to review the lists and make any necessary corrections in the authoritative data source. As a reminder, Retest 1 administrations are not available for the 2012–13 school year. In rare cases where an IEP Team or Section 504 Committee decides a student with a disability requires an accommodation not specified in the state accommodations publication , a request must be submitted using an Accommodation Notification Form. Notes: Orders for EOC Algebra I/Integrated I will be rounded to a multiple of 14. Orders for EOC Biology will be rounded to a multiple of 18, and orders for EOC English II will be rounded to a multiple of 12. Graph paper will be automatically shipped for Algebra I/Integrated I based on student enrollment. Review students marked as requiring p/p accommodated test materials Make all corrections in authoritative source Refreshed daily with 36-hour turnaround (except third-parties) The Accommodated Test Materials Verification page is available to LEA TCs/TAs as a link from the test materials ordering page. The verification page is also available to school test coordinators in NC Education. From My Home, click STUDENTS under MANAGE (right side of the screen). 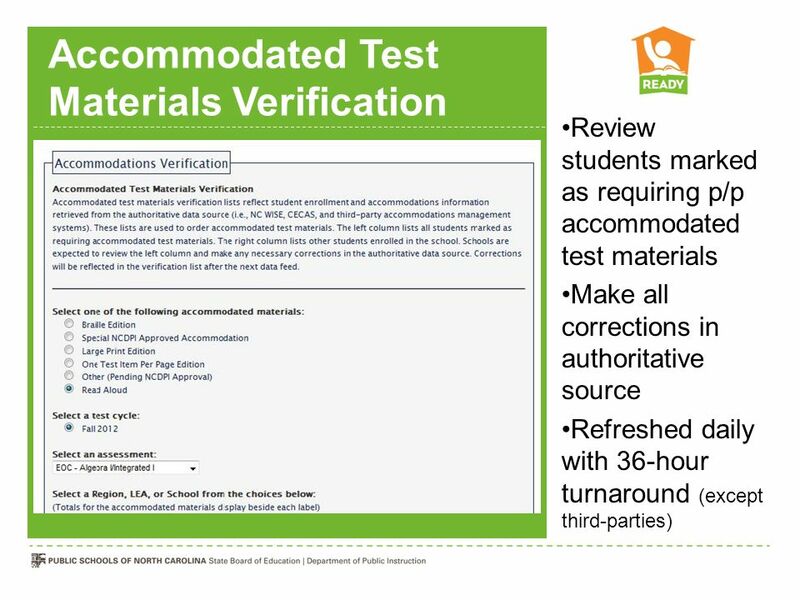 Accommodated test materials verification lists reflect student enrollment and accommodations information retrieved from the authoritative data source (i.e., NC WISE, CECAS, and third-party accommodations management systems). The LEA test coordinator and the LEA test assistant may access the verification lists. The user must select a response for each section to generate a list of students. When a list of students appears on the screen: The left column lists all students marked as requiring the selected accommodated test material. The right column lists all other students enrolled in the school. Schools are expected to review the left column and make any necessary corrections in the authoritative data source. Corrections will be reflected in the verification list after the next data feed. Braille, large print, and one test item per page editions will be shipped for students listed in the left column. The remaining options are available for auditing purposes. If the user is reviewing the Accommodated Test Materials Verification list on one screen and CECAS on another screen, the data may not match. At the close of business each day, accommodations data is pulled from the authoritative source, processed the following day, and made available overnight. For example: Student data is pulled at approximately 5pm on Monday, processed on Tuesday, and available to the user by 7am on Wednesday. 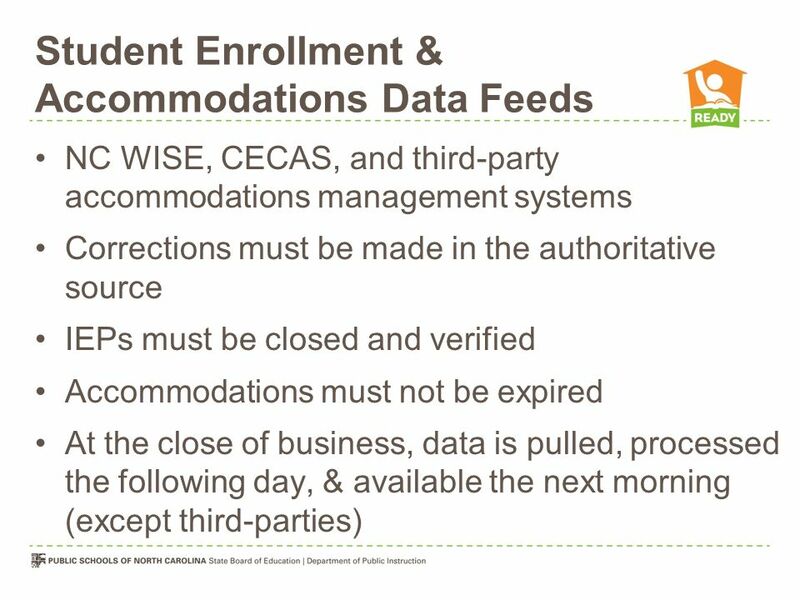 Third-party accommodations management systems normally submit their data to CECAS only once a week. The verification list reflects only the data received. Therefore, the LEAs using third-party accommodations management systems will not receive daily accommodation updates. 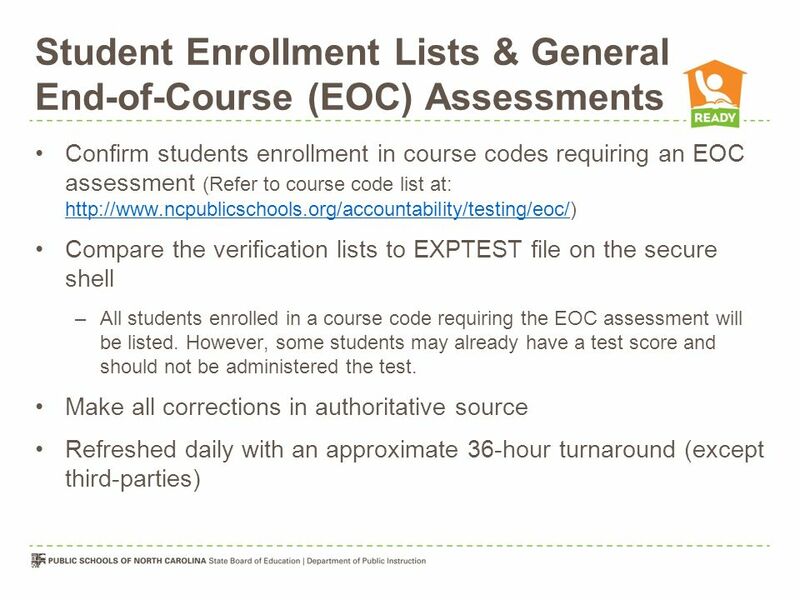 Confirm students enrollment in course codes requiring an EOC assessment (Refer to course code list at: Compare the verification lists to EXPTEST file on the secure shell All students enrolled in a course code requiring the EOC assessment will be listed. However, some students may already have a test score and should not be administered the test. Make all corrections in authoritative source Refreshed daily with an approximate 36-hour turnaround (except third-parties) If your My Home page is tabbed, use the following steps: NC Education, My Home, NC Schools tab, Select the [(school name) (subject) Fall 2012], Enrolled Students. If your My Home page is in a list format, use the following steps: NC Education, My Home, Under Navigation (lower right side of the screen) click Courses, NC Schools, Select the [(school name) (subject) Fall 2012], Enrolled Students. LEAs are expected to review these lists and make any necessary corrections in the authoritative source. Any changes to the authoritative source will be reflected in NC Education after the next data feed. At the close of business each day, data is pulled from the authoritative source, processed the following day, and made available overnight. For example: Student data is pulled at approximately 5pm on Monday, processed on Tuesday, and available to the user by 7am on Wednesday. Therefore, if the user compares NC WISE to NC Education, the data may not match. 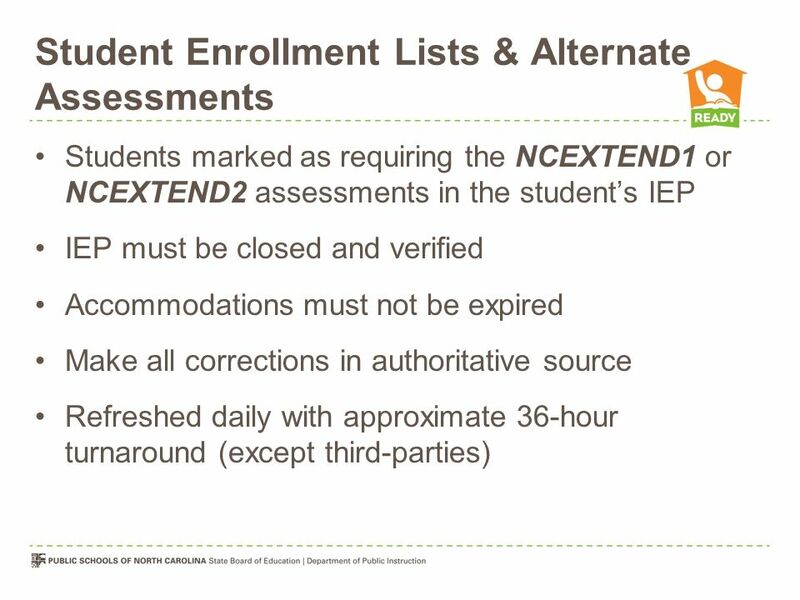 Students marked as requiring the NCEXTEND1 or NCEXTEND2 assessments in the student’s IEP IEP must be closed and verified Accommodations must not be expired Make all corrections in authoritative source Refreshed daily with approximate 36-hour turnaround (except third-parties) If your My Home page is tabbed, use the following steps: NC Education, My Home, NC Schools tab, Select the [(school name) (subject) Fall 2012], Enrolled Students. If your My Home page is in a list format, use the following steps: NC Education, My Home, Under Navigation (lower right side of the screen) click Courses, NC Schools, Select the [(school name) (subject) Fall 2012], Enrolled Students. LEAs are expected to review these lists and make any necessary corrections in the authoritative source. Any changes to the authoritative source will be reflected in NC Education after the next data feed. At the close of business each day, data is pulled from the authoritative source, processed the following day, and made available overnight. For example: Student data is pulled at approximately 5pm on Monday, processed on Tuesday, and available to the user by 7am on Wednesday. Therefore, if the user compares the authoritative source to NC Education, the data may not match. Third-party accommodations management systems normally submit their data to CECAS once each week. The enrollment and verification lists reflect received data. Therefore, the LEAs using third-party accommodations management systems will not receive daily updates to their enrollment and verification lists. 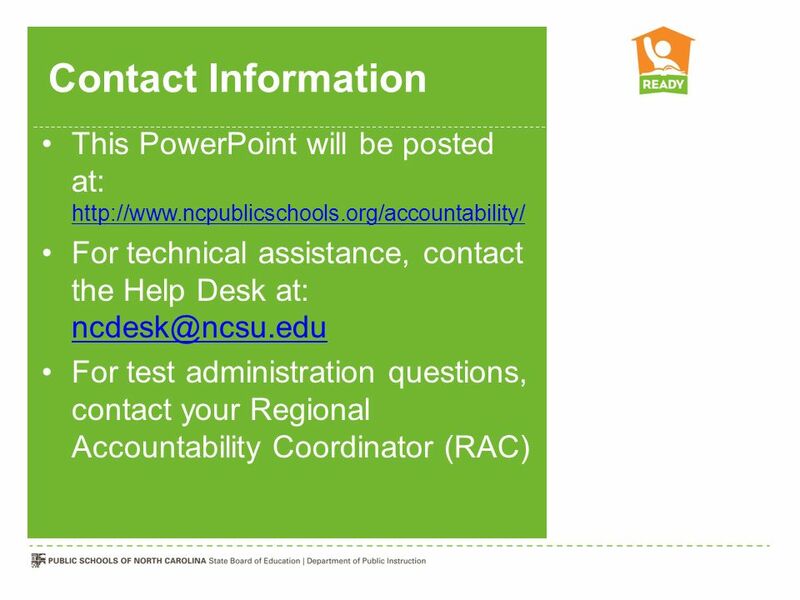 Complete Accommodations Provided Reset, resume, or finalize Special coding If your My Home page is tabbed, use the following steps: NC Education, My Home, NC Schools tab, Select the [(school name) (subject) Fall 2012], NCTest Admin for (subject) Fall 2012. 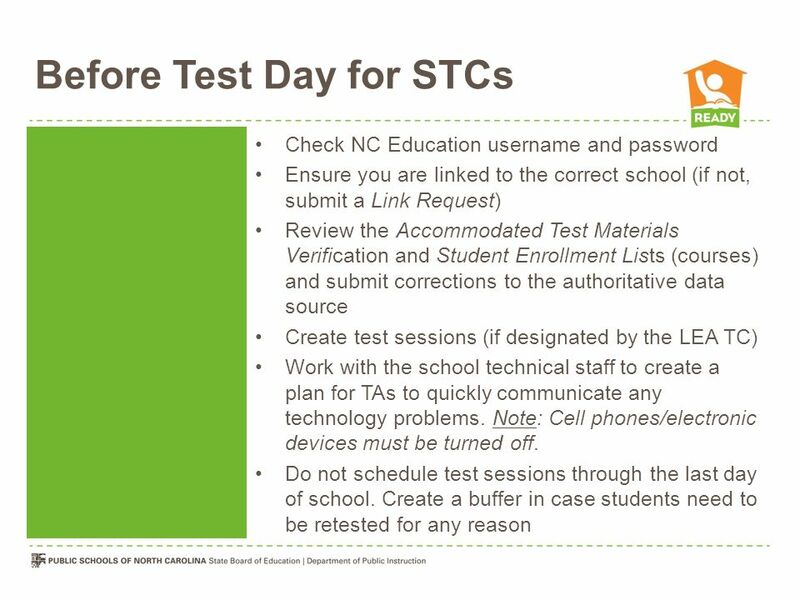 If your My Home page is in a list format, use the following steps: NC Education, My Home, Under Navigation (lower right side of the screen) click Courses, NC Schools, Select the [(school name) (subject) Fall 2012], NCTest Admin for (subject) Fall 2012. You will notice several changes to the NCTest Admin Page for the school year. Descriptive text was added to each tab and included in “mouse over” balloons to assist users with the new features. 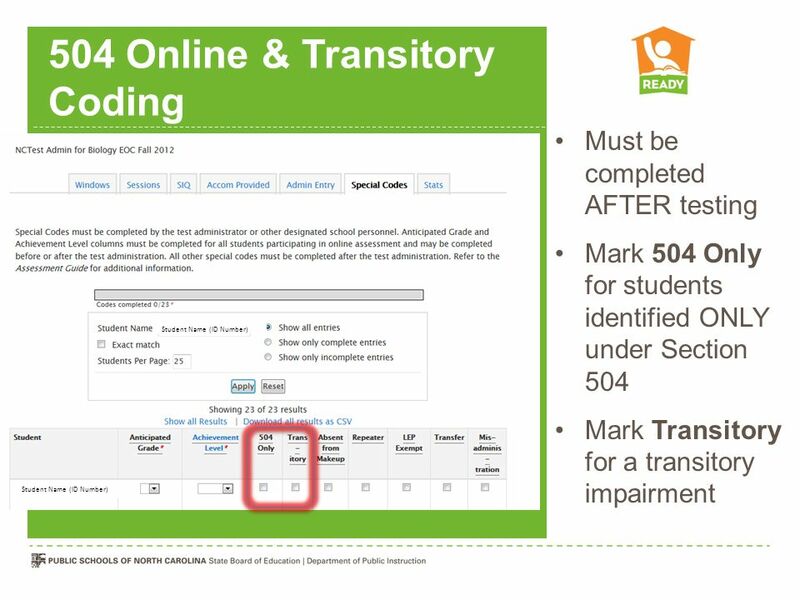 Student records with manually added SIQs or edited SIQs will not accept updated data from the authoritative source for the edited accommodation All corrections must be made in the authoritative source (NEW) CRTA, MTS, or other requires Accommodations Provided Student Name (ID Number) Online assessments are available in regular or large font and in alternate background colors to all students; however, the NCDPI recommends these options be considered only for students who routinely use similar tools (e.g., color acetate overlays, colored paper, large print text) in the classroom. In order for a student to access large font, an alternate background color, the Computer Reads Test Aloud—Student Controlled accommodation and/or the Multiple Testing Sessions accommodation, they must be entered into the student’s SIQ before test day. 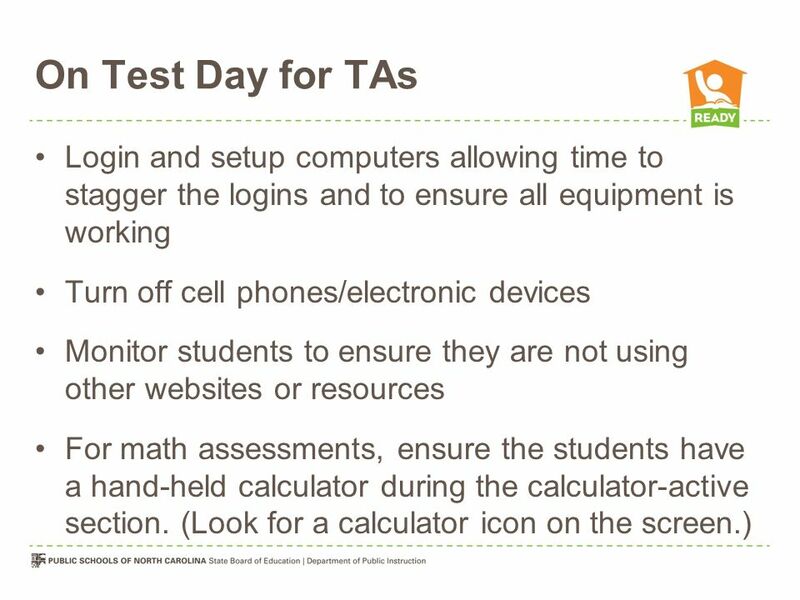 Manual changes may be made to the SIQ screen by school teachers/test administrators, school test coordinators, LEA test coordinators, and LEA test assistants. However, once an accommodation is manually edited in the SIQ, that accommodation for the student will no longer receive updated information from the school’s authoritative source. 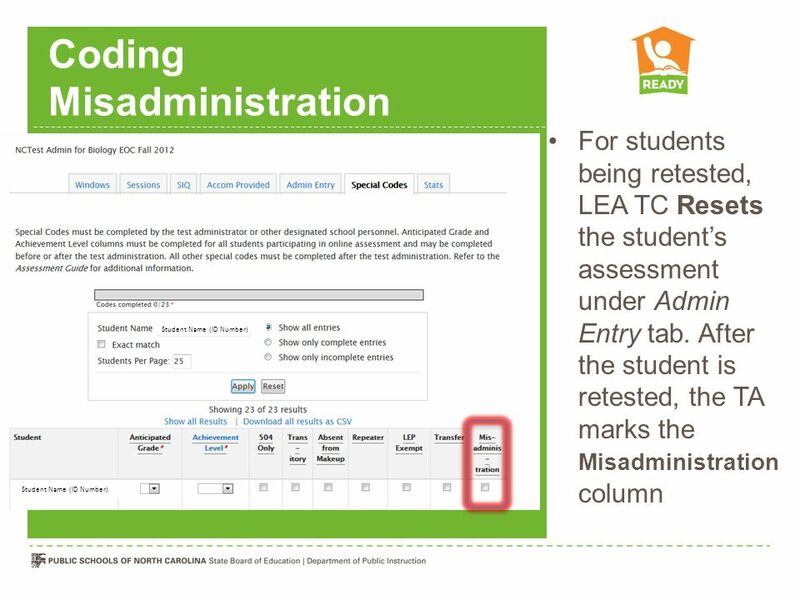 Test records for students marked as requiring the Computer Reads Test Aloud-Student Controlled accommodation, the Multiple Testing Sessions accommodation, or other required accommodations will not be exported to the LEA test coordinator until the test administrator completes the Accommodations Provided screen for the student. 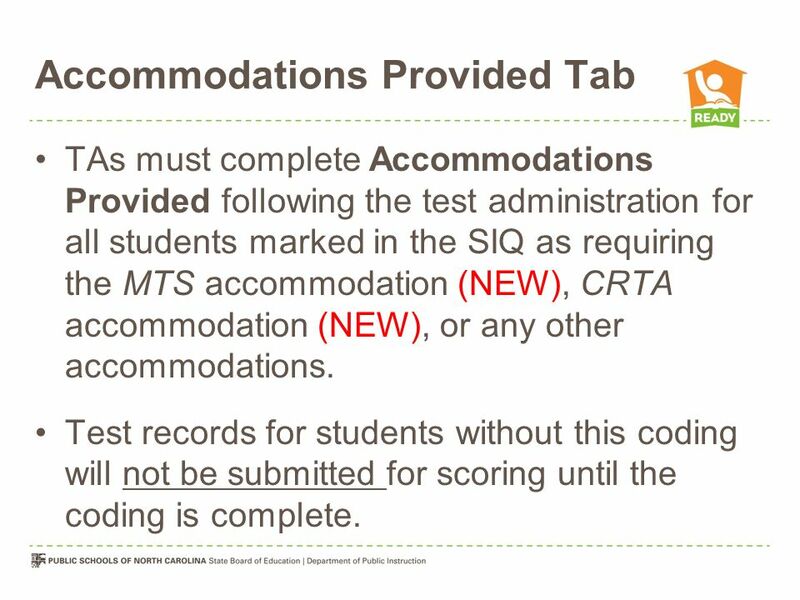 TAs must complete Accommodations Provided following the test administration for all students marked in the SIQ as requiring the MTS accommodation (NEW), CRTA accommodation (NEW), or any other accommodations. 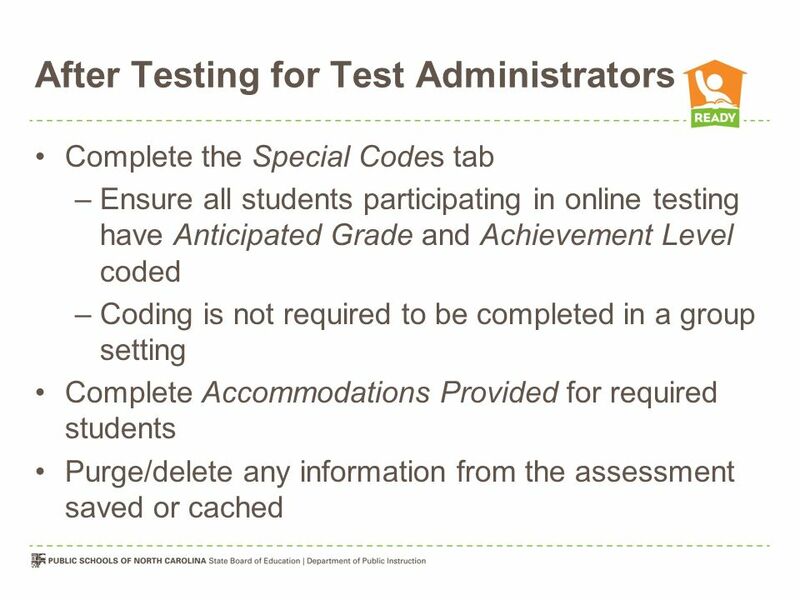 Test records for students without this coding will not be submitted for scoring until the coding is complete. 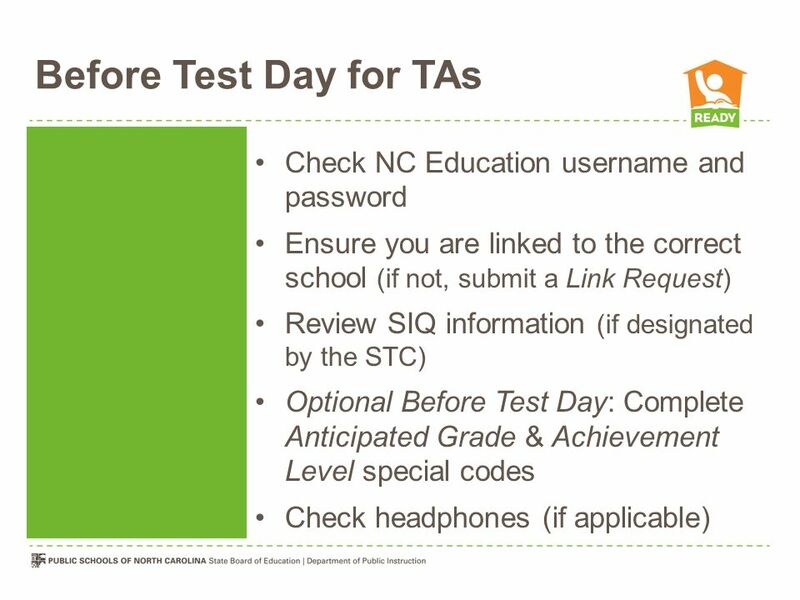 Test administrators must complete Accommodations Provided following the test administration for all students marked in the SIQ as requiring the Multiple Testing Sessions accommodation (NEW), Computer Reads Test Aloud - Student Controlled accommodation (NEW), or any other accommodations. Test records for students without this coding will not be submitted for scoring until the coding is complete. Refer to the Assessment Guide for additional information. 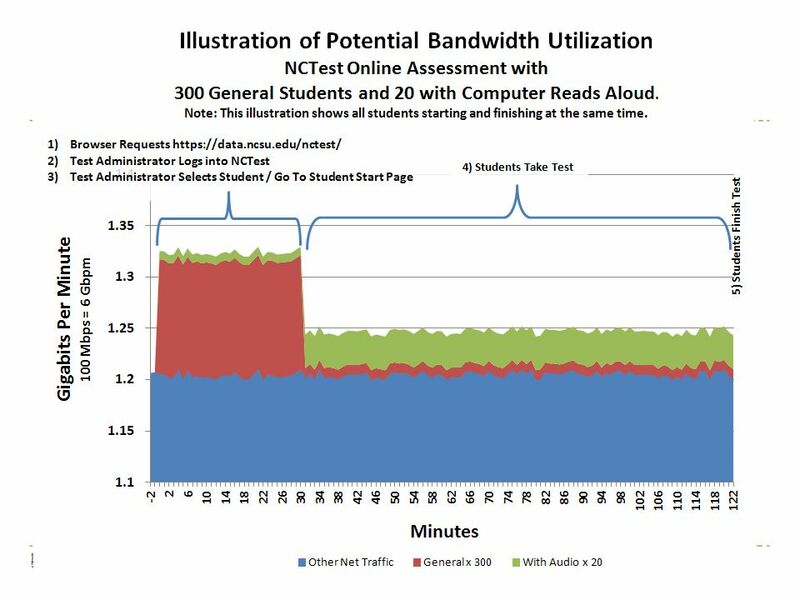 Interruption during the test (e.g., loss of Internet connection, illness) The student’s assessment may be resumed on any computer. The test will resume at the last accessed webpage prior to the interruption. Items not displaying or not displaying correctly Click the NEXT or BACK buttons to refresh the item. Items appearing slowly on the screen Contact the school’s technical staff is items appearing slowly could mean that the server, the network, or the student’s computer is running very slowly. 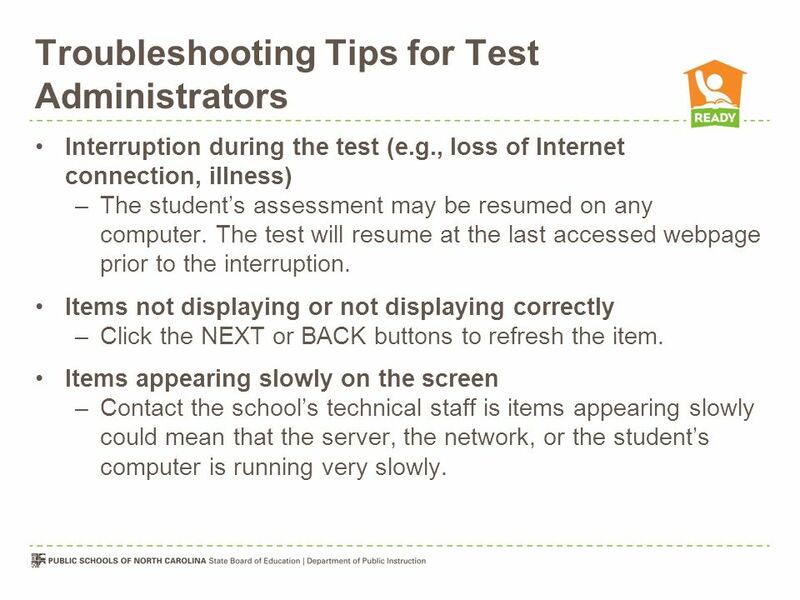 Interruption during the test (e.g., loss of Internet connection, illness) The student’s assessment may be resumed on any computer. The TA must log in again, choose the assessment, select the student, and click START to resume the test. The test will resume at the last accessed webpage prior to the interruption. Items not displaying or not displaying correctly Click the NEXT or BACK buttons to refresh the item. 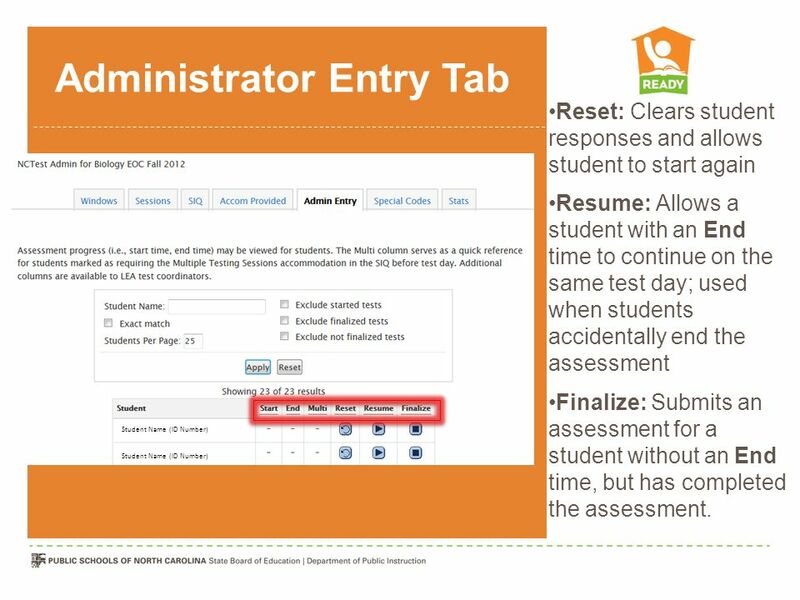 If the assessment does not resume correctly, the TA should use his/her best judgment to make a written note of the item number on the screen, close and restart the web browser, log in the student again, and click START to resume; or if the test administration time is close to the end, the test administrator must contact the STC. Items appearing slowly on the screen Contact the school’s technical staff is items appearing slowly could mean that the server, the network, or the student’s computer is running very slowly. 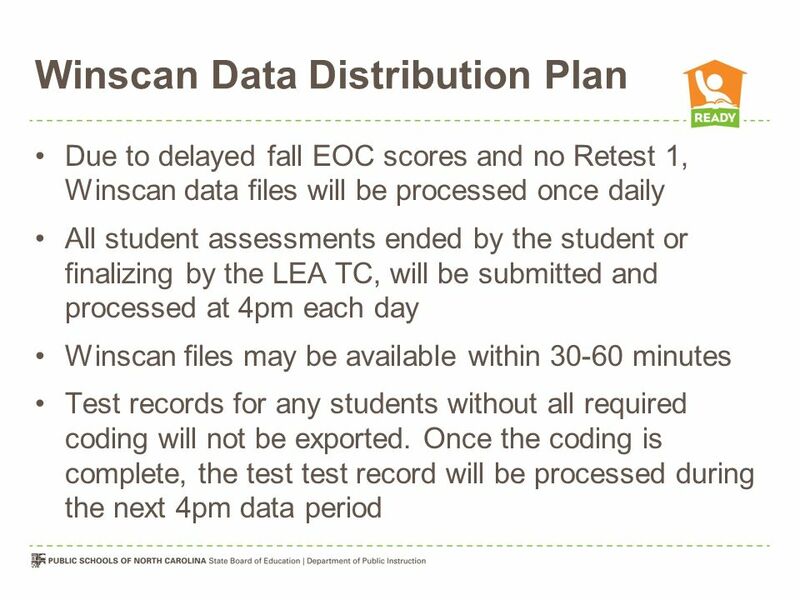 Due to delayed fall EOC scores and no Retest 1, Winscan data files will be processed once daily All student assessments ended by the student or finalizing by the LEA TC, will be submitted and processed at 4pm each day Winscan files may be available within minutes Test records for any students without all required coding will not be exported. 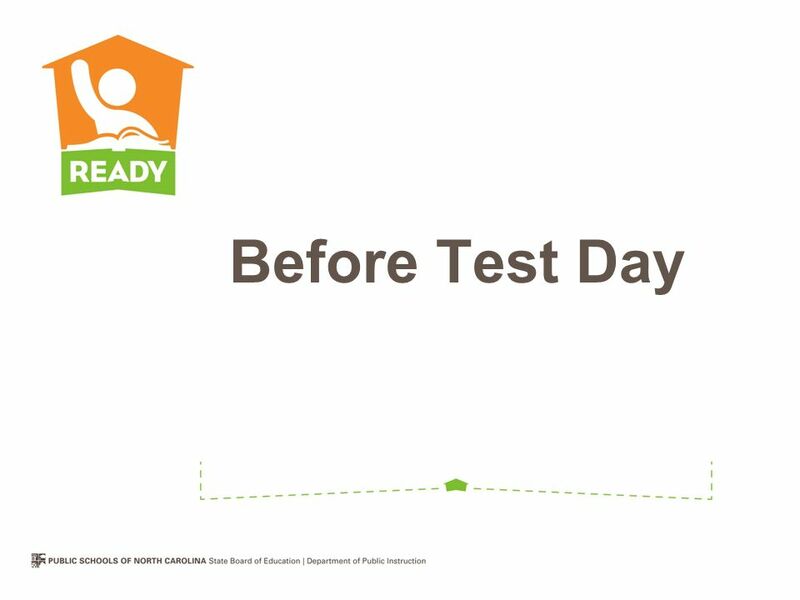 Once the coding is complete, the test test record will be processed during the next 4pm data period Additional information is forthcoming to LEA TCs. Download ppt "Online Testing What You Need to Know November 19, 2012"
February 2014 SAGE SUMMATIVE TRAINING FOR ADMINISTRATORS Research & Assessment Canyons School District. TIDE Presentation Florida Standards Assessments 1 FSA Regional Trainings Updated 02/09/15. Test Administrator Interface Training Computer Based Administrations of: ELA Writing 5-11 ELA Reading and Listening 5-8 Mathematics Algebra 1, Algebra. Online Assessment Update 1. 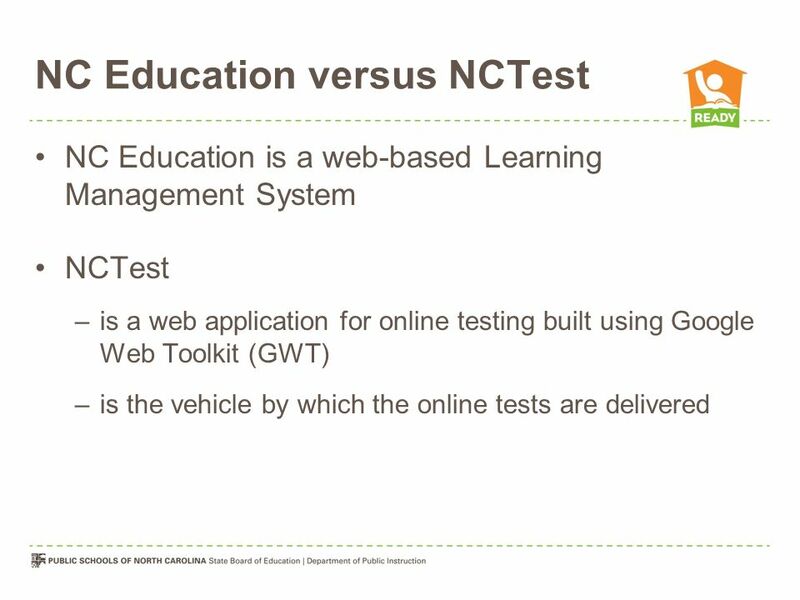 NCTest Web application for online testing built using Google Web Toolkit Technology enhanced (drag/drop), constructed response. 1 Unit & District Tools Phase 1. 2 To access the new Unit and District Tools, you will need to click on the link embedded in the MyScouting Flash page.  Minimum System Requirements  Updates to Proctor Caching  Updates to Configure TestNav  Setting Up Your Infrastructure  System Check Utility  Resources. Using the Online Practice and Training Tests and Training Tests 1 – 2:30 p.m. November 5, 2014 California Assessment of Student Performance and Progress. 1 Technology Readiness Maryland /2015 Admin Schedule 2 AssessmentOnline/CBT Testing Dates PARCC - PBAMarch 2 – May 8 MSA ScienceApril 13. 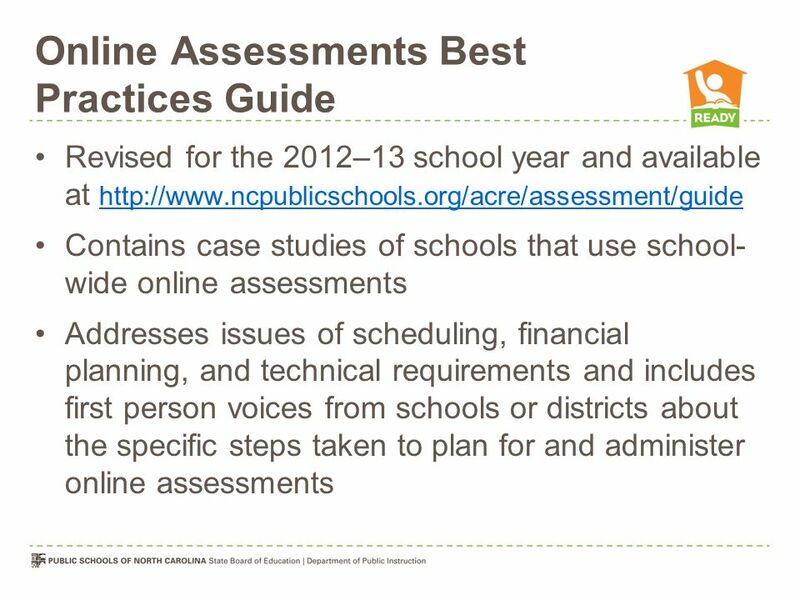 Edgecombe County Public Schools Schoolnet Assessment Training (HOME BASE) November/December 2013 Accountability Services ( ) 1. Linking Studies EOG and NCEXTEND2 EOC and NCEXTEND2 Assessment Training April 3, 2013. EdPlan Website: Default password: 2012txhouston Recovering Your Password 1. To re-activate a disabled. OAKS Online Test Delivery System Familiarize users with new enhancements to the OAKS Online Test Delivery System and processes related to online. 2015 CMAS PearsonAccess Training for SACs select Colorado from the drop down. Spring 2015.